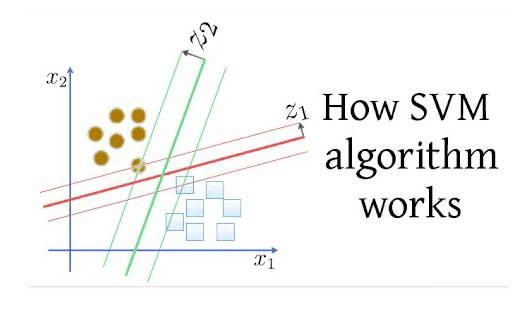 Support Vector Machine (SVM) is a supervised machine learning algorithm that can be used for classification as well as regression challenges. It is said to be one of the most popular high-performance algorithms and is implemented in practice using a kernel. In this algorithm, the dataset explains SVM about classes so that it can classify new data. It works by classifying data through finding the line which separates data into classes. It tries to maximise the distance between the various classes and referred as margin maximisation. SVM can be classified into two categories one is Linear SVM in which classifiers are separated by hyperplane and other i.e. non-linear SVM which is applicable for a more complex task which cannot separate training data using hyperplane. SVM is preferable to approach when you have a huge number of features and especially SVM with non-linear kernel performs quite well in most of the cases. They are useful while you are seeking for ordinal classification. It offers best classification performance on training data and is said to be more efficient for classification of future data. It does not make any assumptions on data and does not over-fits the data. It also uses kernel trick so you can have expert knowledge about the system but it only covers the determination of parameters for a given value of regulation and kernel parameter. It is commonly used for stock market forecasting and can be used to compare the relative performance of other stock keeping sector same, which helps you to manage investment and take decisions. It is a promising classification approach for detecting persons with common diseases and should be further explored in other complex diseases using a common variable. Data science libraries implement SVM in python and R.